The Brazo Family is a well known family of lucha libre. The heart of the family are the six sons of Shadito Cruz, who all took the Brazo name at one point in their career. Brazo de Oro was the first, and others were named off his identity. The most famous Brazo match took place against another family of wrestling, the Villanos. The highpoint of their never ending feud was a trios match with on 1988.10.21, where all masks were on the line. Villano I, IV, and V won, and El Brazo, Brazo de Oro, and Brazo de Plata lost their masks. The bloody nature of the match - which continued in various combinations of rematches for decades after - and three people losing their masks at once makes it a noteworthy match. The Brazos trios continued, but the names changed. The other Brazos filled in for the original three during times of injuries or other unavailability. Super Brazo was first, and he was later followed by Brazo Cibernetico and Brazo de Platino. Various combinations of the six have worked as El Brazos in the decades since they started, but recently (2007) Brazo de Plata declared that only he, Oro and El Brazo should be promoted as Los Brazos and any other combination was fraud. While many of the original Brazos are active, their sons have also started to wrestle. 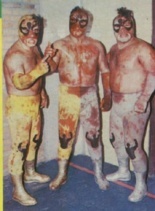 Brazo de Oro Jr., Brazo de Platino Jr., and Brazo de Plata Jr. all debuted as second generation Brazos. In 2004, Brazo de Oro and Braza de Plata had their sons change to unrelated and individual identities, feeling the name "Brazo" had been worn out, and lost some of its value due to many hair match losses. A Brazo Jr. is currently wrestling in IWRG. It's not known for sure if he's El Brazo's son - after all, if Maximo was using Brazo de Platino Jr. because Brazo de Plata Jr. was taken, it could be another kid of Oro or Plata. Goya Kong Robin Brazo Cibernetico Super Brazo Jr.
El Hijo del Brazo de Platino? El Brazo Jr. is not related to El Brazo but may have permission. Andros de Plata also claims to be part of the family but does not have permission - they loaned him the name for payment, but he didn't pay. Pages in category "Brazo Family"
This page was last edited on 14 October 2018, at 06:51.